As part of my game engines class, we made a level in UDK as well as a weapon mod using wotgreal. Below is a video showing them both. The level is named Counter-Clockwise, as it is two large rooms connected by two hallways, with triggers to open a door in one hallway that closes the door in the other, as such you can only move through it in a counter-clockwise direction. Also demonstrated in the video is our weapon, the Fibonacci Bomb. It is a modification of the shock rifle. We modified the alt-fire to shoot a bouncing electric ball, in clusters according to the fibonacci sequence. For example, the first two shots are just a single projectile, but then it shoots 2, 3, 5, 8, 13, 21, and finally 34 projectiles at once. The bouncing has been modified so that there is some variation, that way the cluster gets more and more spread out the more it bounces. The weapon is absolutely deadly in tight hallways. Leprechaun Tears was the name of the game engine we developed in our Game Engines class, named solely so we can make the bad joke that our game is powered by leprechaun tears. In this project, I was responsible for the overall architecture of the engine and mini-golf game that it was running, as well as all of the rendering, while my partner Kyle did the physics and file I/O. Near the end, we began work on a procedural mini-golf course. I took inspiration from my It’s Not the End of the World terrain generator and tried to make it perlin noise based, however it didn’t come out as fancy as we would have liked due to having only one week to work on it, and that week was also the final push for our Bar Crawl project above. Attached is the source code (with visual studio solution) and a video showing a few levels. For the source code, wrote most (or all) of every file except for Ball.cpp. It’s Not the End of the World was a game started for my senior capstone project. I served as lead developer for this project. I designed up the architecture of the game, and designed the skeleton whenever a new feature was about to be introduced that my team mates would fill in with more specific code later. 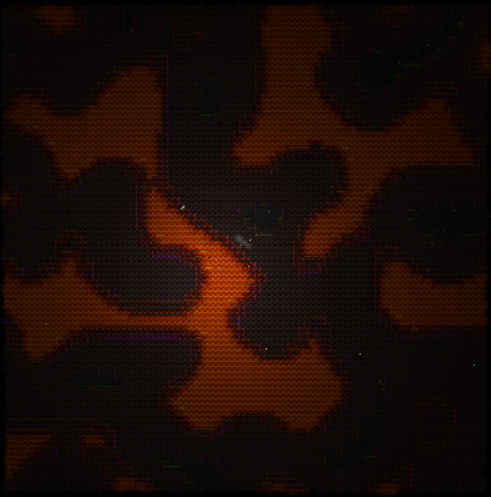 My greatest personal achievement out of this project was my procedural terrain generator based on Perlin Noise. 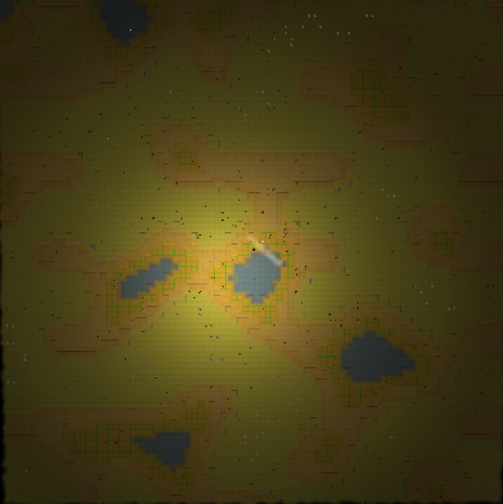 The mesh generator and the desert generator are linked as a sample of my coding abilities. 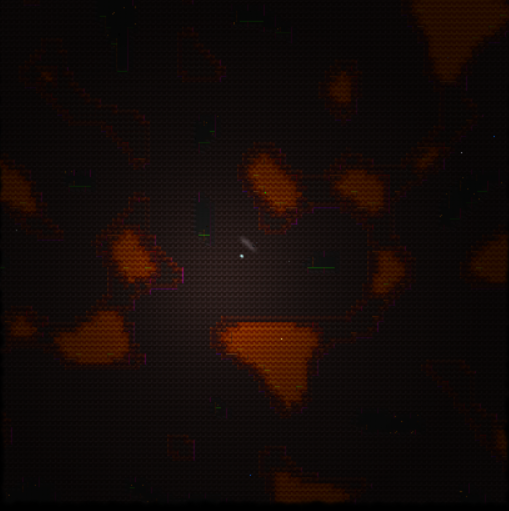 Note: weird green and purple lines in the images are Unity artifacts. They did not render in-game. Also, the lighting is a little off as these are not in-game shots. 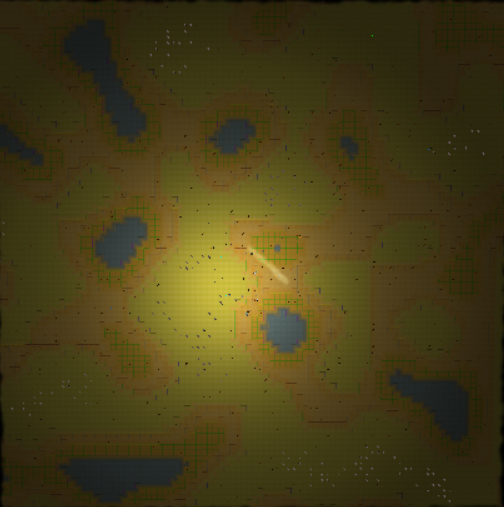 They are zoomed out views, and the light is from a point light that followed the player around. The speckles are trees, rocks, and other decorative objects that made the terrain seem more realistic. Shortly after starting school at UC Santa Cruz, I started playing Dungeons & Dragons. Between late 2010 and early 2014, I have written and been the game master of 4 separate campaigns. They have taught me a great deal about game design in general, as well as how to judge player reactions and anticipate what they want, as well as how to adapt quickly based on how players react or what they want to do. Included here is an example of my graphics programming abilities. This particular project was programmed in C++ using OpenGL and GLUT. The terrain is generated from a height map and diffuse texture that were provided by the professor, but the snowmen are being generated using GLUT function calls; it uses no pre-built models. This is not a demonstration of artistic ability, just of coding.